LIC’s Bonus rates for 2014-2015, have been declared on 1st Sep,2014. Every year LIC declares bonus rates on all its Products. It is very important to track the bonus rates for the plans you hold. The returns on these plans are mostly dependent on the bonus rates declared by LIC. 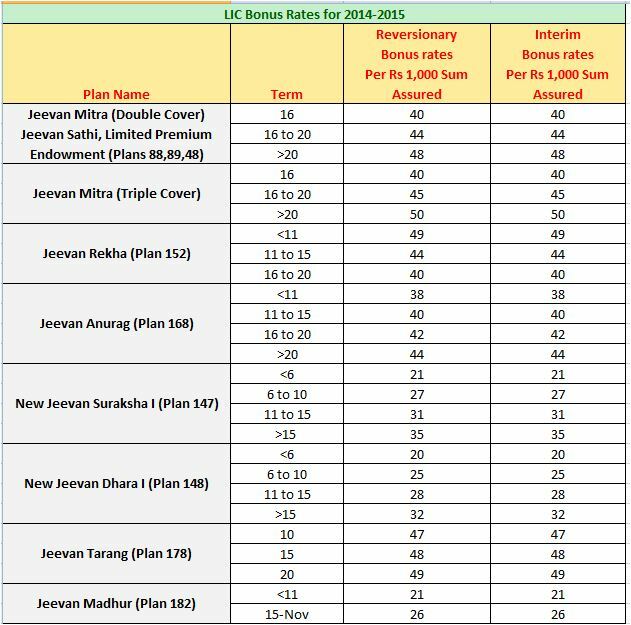 For most of the plans,LIC has kept the same bonus rates when compared to last year’s. How to read the below table? How to calculate the bonus amount for my life insurance policy? 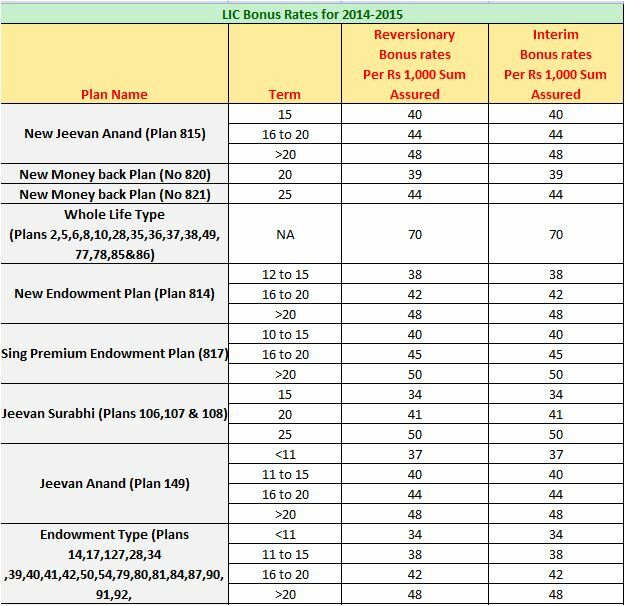 In the below table, on “ New Jeevan Anand” 15 years plan – LIC has declared Rs 40 per Rs 1000 Sum Assured. If you had bought a similar plan for a Sum Assured of Rs 2,00,000 then the bonus amount on your policy would be Rs 8,000 ((SA/1000)*40). Like this, every year LIC declares bonus rates. The rates may vary. Remember, these bonus amounts are not paid to you immediately. They are accrued and paid on maturity or claim. Like Reversionary Bonus, LIC also declares Final Additional Bonus (FAB) rates every year. Generally, FAB is paid to those polices which have a minimum tenure of 15 years. FAB is a one time payment. 2) surrender value if all the 16 premium have been paid. Kindly contact your agent/LIC for these details. It is an endowment policy and my view is better not to invest in these kind of plans. Suggest you to buy a term plan if you need life cover and discontinue this plan. Term insurance Vs traditional endowment plans. Loyality addition from 9th Year on wards applicable per 1000 and calculate for every year upto 19 years. ie is loyality addition upto 19 year is the amount. I will be happy, if the above details is helped you. I have taken Jeevan anand policy in july 2013 for sum of 100000.In the vested bonus I could see only 48000.
actually for 2013-2014 they have announced 48 for 1000 rs sum assured and in 2014-2015 they have announced 49 for Rs 1000 assured .Total it should be RS 9700o .But it is showing 48000. Dear Pavan..How did you get Rs 97,000? Normally they display the present value of all your expected bonus income. i have a LIC policy (table 14) and have 6 annual installments. I found that new jeevan Anand policy for the same amount is better in terms of sum assured and bonus. will it be better if i move out of first one and opt for the second one. It is better to avoid moneyback/endowment/whole life plans alltogether. How to get rid of bad insurance policies? I have taken a New Jeevan Shree Policy (Table No-151) on 8-Nov 2011. Up to now I paid all my premiums, 3 more premiums are due as it is 16 yrs premium payment term. How much would I get If I surrender now. When is the best time to surrender to get good returns. Could you please advise. ? If policy commencement year is 2011 and PPT is 16 years then how come only 3 more premiums left? Kindly get rid off these kind of plans and opt for a term plan instead. Apologies Sreekanth, It was my typo error. My New Jeevan Shree Policy (Table No-151) commenced on 8-Nov 2002 for the period of 25 years and paying term is 16 years. Up to now I paid all my premiums, 3 more premiums are due . How much would I get If I surrender now. When is the best time to surrender to get good returns. Could you please advise. ? As you suggested, I realized couple of years ago and enrollled for term plan online. Since you have already paid most of the policy premiums, suggest you to continue with it. Good to know that you have bought a term plan. I have bought a LIC’s NEW MONEY BACK PLAN-25 YEARS for 1 lakh and I would like to know the approximate maturity amount which I would get. Why did you buy this plan? Read my article – LIC new money back plan : review . Thanks for starting blog. I have query regarding Jeevan Saral ( asked to lot of sources like Agent /LIC customer care) but nobody is able to answer. I am paying 60000 Rs Yearly premium for past 7 yrs .Last year LIC declared Loyalty addition as 375 . 1) Can you tell me is it same for all policies which completes 10 yrs in feature also ? 3) Is it good to surrender policy now ? Why is your agent not answering to your queries. It is his duty or responsibility to answer you, right? These kind of plans will give you returns of around 5% only. Suggest you to discontinue it. Do you have any life insurance plans? As of now I do not have the required details, you may contact your LIC agent or nearest LIC branch. This is a policy with Guaranteed additions, hence not eligible for Final Additional Bonus or Bonus. At the end of 25 years you will get – SA + (7.5% of SA*25) + Loyalty additon. 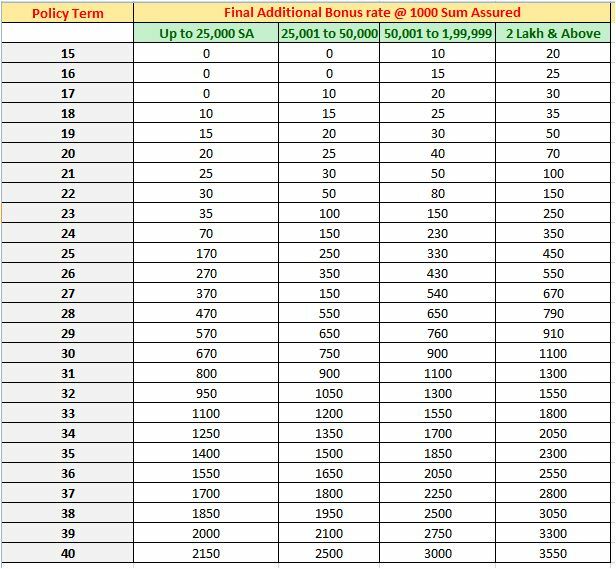 I too hold this policy since 2002 Nov (New Jeevan shree table 151) and on my query regarding L.A, LIC reponded by saying Loyalty addition will be around 950 per 1000 sum assured for a 25 year old policy. Dear Mr. Reddy, U r very informative.I have jivan saral plan of lic taken in april 2010 with a monthly premium of 1021/,sum assured 250000/,term 16 years.I have not satisfied with the plan as it has not get any loyality addition nor any bonus till now.whether i should surrender it,wait for another 5 years to get loyality addition or wait for full term.what will i get in maturity.Lic handbook of private publisher says that it will be around 4 lacs. LIC Jeevan Saral is an Endowment plan. You may get returns of around 5% to 6% from these kind of policies. Do you hold any other life insurance plan(s)? Kindly read my article – How to get rid off bad insurance? sir,I have few other lic plan since 2002,they are going to mature after 5 years gradually after year to year till 2030, i m paying 2500/per month for these,with a coverage of 10 lacs.Apart from this I have Birla sun life Dream Endowement plan which I taken in 2010 with a yearly premium of 19000/ with a coverage of 25 lacs,maturity in 2030,my retirement year from a PSU.Please advice what to do. May I know your age? How many of your family members are dependent on you? Do you have any existing financial liabilities (loans)? What are your financial goals and commitments? Dear Mr. Reddy,I’ve a wife and 2 kids ,one in class 6 and another in calss 3(girl child),dependent on me.I’ve no any financial liability at present.My age is 45 and at present I have nearly 18 lacs in my Pf ac. as a corpus which is being compounded to nearly 1 crore along with my present deduction in 2030,my retirement year. Kindly understand the importance of TIME VALUE OF MONEY. Rs 1 Crore in 2030 may or may not be sufficient for your retirement. Kindly read my article – “Retirement planning in 3 easy steps“. Also, suggest to buy a Term insurance plan. Kindly read my article “ top 7 best online term insurance plans“. For Kids’ Education goals, kindly go through my article – “Calculate how much to invest for your kid’s education goal“. I have 5-6 policies Jeevan Saral & Jeevan Ananad. Most of them are of 7-10 years old and have terms of 15 to 20 years. I want to surrender or paid up these policies, as I had already covered myself with term insurance. I would like to invest the amount I receive from surrender value and saving of not paying premium in some good investment plans. Basically I want to correct my mistake of mixing insurance and investment. What is best time to take decision of surrending or paid upthese policies? I like to invest my money apart from LIC, could you suggest me a way to invest my money. What is your age? Salaried person? What are your financial goals? Hi, My age is 26 salaried person can save 1oooo per month then regarding financial goal in the sense have to invest money in right place and everything am planning for long term benefit. If you have dependents, kindly take a good term insurance plan first. Also, do buy a health insurance plan. You can consider investing your savings in Equity mutual funds. Kindly read my article “Top Equity Mutual funds“. LIC Jeevan Lakshya (plan no 833) is a new plan. So we need to wait for few more months to get the data from LIC. Kindly note that FAB rates change every year. So, the FAB rate that is applicable to your policy depends on the Bonus rates that LIC declares during that maturity year. I have one LIC POLICY , old Jeevan Shree, Table no table no 112. It is a 20 years Premium paying term.Taken the policy on 28/8/2001. Could you kindly tell me, as per the present bonus rate, how much can I expect from LIC under different head.. Bonus, FAB, LA etc etc on maturity? To calculate the exact bonus amounts, we need bonus rates for the past 14 years. I do not have these details with me as of now. But we can expect returns of around 6% from these kind of policies. If you have enrolled this policy online, you can view the bonus (accumulated vested bonus) details online. Else you can also contact your agent to get the details. It is his/her duty to help you out. Let me know the Sum Assured of your policy, based on that I can inform you about the latest FAB rate (2014-2015). Regarding Loyalty Bonus, you may expect one time payment of around 8% of your Sum assured. I took an LIC eevan anand policy for sum assured of Rs 1 Cr, with premium Rs 206720/- yearly and policy term is 40 years. Policy date commencement 11-12-2013, and date of maturity is 11-12-2053. My doubt is Hw good is this policy on the long run. shall I continue this plan. what shall I do. I need to pay the second premium, but I’m stuck up in deciding whether this policy overcomes the longrun inflation. Thanking You. Your yourself answered the query. These kind of endowment plans can not generate decent inflation-adjusted returns. You can pay premium for three years and consider surrendering the policy. You may lose some money but you can certainly look for better investment alternates, which can not only cover the losses you made on this policy but also can generate positive returns. Before surrendering this plan, buy a good Term insurance plan. Once you get the term insurance coverage, you can go ahead and surrender this plan. Im 32 years Female and i would like to invest 15K – 20K per year in an best LIC policy, I have already taken Jeevan Anand. Let me know which is the other option which will have the features that didnt cover by jeevan anand. Do you have Term insurance plan? There is absolutely no need to INVEST in an insurance plan which is other than a good term plan. Kindly do not mix insurance and investment. You can buy LIC’s e-term plan (if you are under insured). Thanks for putting up consolidated information on current bonus rates and giving useful suggestions! Could you please share the historical FAB rates for traditional endowment plans (with policy terms greater than 20 years)? I am unable to find this data on LIC’w website (the link to FAB rates historical data is broken). And is loyalty addition applicable to traditional endowment policies like table#14 plan? I do not have the requested data with me. If I find this info, i will surely share it here ( I guess you have not provided correct email id while submitting your comment). Do you hold any LIC policy? Thanks for the prompt response! Yes, I have a few traditional endowment policies with policy periods ranging in the 20s. I would like to decide partly based on historical data whether to stop paying the longer term policies or the shorter term ones. While historical data for past 10 years seems to be available on LIC website, history of FAB rates is not available. Suggest you to read my post on “How to get rid off bad/unwanted insurance?” This post may give you an idea about about surrender and paid-up options. Also, you can contact your LIC agent for past years’ FAB/bonuses data. They have to help you. Kindly check with them. Thank you very much indeed Sreekanth.. It is very informative. Sivaram – Thank you. Kindly share the post with your friends too. Keep visiting.. Informative. Please correct the following – In the chart the Bonus should read 4%, 4.4% etc since the bonus is 40 or 44 per thousand. Pradeep Hattangadi – Thank you. I have now corrected it. I have a Jeevan Saral Policy availed in 12/03/2009 – for 35 Years with annual premium of Rs. 22,048 (Sum Assured – 175000, Accident Risk Cover – 175000. If I complete the 35 Years term what would be my net take with Maturity/Bonus/LA? If I complete the 25 Years term what would be my net take with Maturity/Bonus/LA (Understand 10 years and above could be surrendered). Please advise. Suggest you to buy a Term insurance plan (if you do not have one) and then make this policy a PAID-UP one.